6??????? ASKING OF QUESTIONS WITH NOTICE ?? 8.15?? September 2012 Local Government Elections?LATE ??? RTA have now engaged Consultants to prepare a new full and comprehensive flood study which will be provided to Council upon completion.? At this time Council will be able to proceed to complete a new Flood Plain Risk Management Plan incorporates a revised matrix. The General Manager present an overview of the Annual Report to Councillors upon its completion. Manager Business Development prepare a digital economy strategy re identifying blackspots to be presented to the NBN Co for rollout consideration. September 2011.? Due to World Rally preparations will need to be deferred until October 2011. No response as at 26/10/2011. Grants Officer investigate grants for solar lighting and that the V-Wall be included in the quarterly budget review to see whether solar lighting can be funded. No success with grant funding to date for solar lighting, however following Council resolution on 4 August 2011 to write to the LMP (Crown Lands) - Confirmation has been received that LMP (Crown Lands) will replace the light poles on the basis that Council accept the maintenance responsibility for replacement of the globes, controls and fittings of the lights (as per the existing arrangement since the lights were installed along the V-wall) and that Crown Lands is responsible for replacement of the poles,. GM writes to the Minister of Local Government for seeking dispensation for Councillors.? Letter sent to DLG on 11 August 2011.? Telephone advice received w/e 7/10/11 advising the DLG had received the letter, the staff member was on leave, but it was being considered.? Follow up telephone call was made on 20/10/11.? Staff member still on leave.? Advised they would be back on 25/10/11 with a response to follow after that date. Report to October 2011 Council Meeting.? Deferred to November 2011 due to work load. Council write to Biomass re awareness campaign for what is/is not to be placed in the red bin.? Council write to CHCC seeking clarification as to Biomass? plans regarding the upgrading of its facilities to produce a complying product from mixed waste and whether there are any changes to the proposed costs. Council receive a further report at the October GPC to consider appropriate drainage design standards based on the GHD document ? Seaview Street, catchment. Report to Council meeting on 16 November 2011 GPC due to full agenda for November GPC due to the full agenda of October GPC. That more information on the pilot program for the aquatic system monitoring be provided to a future GPC meeting. Information being sought for presentation to future November GPC meeting. Council write to Federal Minister for Industry, Min for Infrastructure and Transport, Mid North Coast RDA express Council?s extreme concern at the loss of 25 jobs at Express Coaches. Council offer 8.9 ha of high conservation land at Lower Nambucca to the RTA for their biodiversity offset strategy for the Pacific Highway upgrade in exchange for providing Council with title to the North Macksville Soccer Fields and Casey Drive. Council receive a report on rating arrangements for caravan parks as well as options in relation to the minimum rate for the residential category and a report on the farmland category to address existing anomalies. Council to receive a report re a more efficient way of having cars in the car pool and also more cost effective communication than mobile phones. Council defer consideration of request to support a waiver of a SEPP 71 Master Plan for a subdivision off Alexandra Drive, Bellwood to allow DEP to peruse additional information. Council arrange a delegation to the Premier to discuss the need for funding to repair the Bellingen Road. AUTHOR/ENQUIRIES:???? Joanne Hudson, Manager Human Resources; Michael Coulter, General Manager ???????? Changes announced in the 2011 Budget to the statutory formula method for calculating car fringe benefits are now law. Under these changes, the progressive statutory rates have been replaced with a flat statutory rate of 20%, which applies regardless of the distance travelled. The new Fringe Benefits Tax (FBT) rates apply to new vehicle contracts entered into after 7.30pm on 10 May 2011, but will be phased in over the next four years. Financial modelling undertaken by Council?s Finance Officer, based on the distances travelled by the 22 private use vehicles in the FBT year ended 31 March 2011, indicates that Council?s FBT liability for motor vehicles will increase from $46,000 this year to $111,500 in 2014 as all of the cars are changed over and the new 20% rate is applied. This additional $65,500 cost, or an average of $2,977 for each of the 22 vehicles, is split about equally between Council related travel and private travel. It should be noted there are significant individual differences in the annual kilometres travelled by Council cars and the ratio of Council related travel to private travel.? These variations arise as a consequence of the nature of the employee?s job, where they live, their family circumstance and private travel patterns. The objective of this report is to provide a strategy for managing the financial impact on Council within the parameters of its legal obligations and desired status as an employer. 1????? That leaseback fees be increased by 10% per year for 5 years. 2????? That salary packaging of motor vehicles be discontinued for all new staff where a Council motor vehicle incorporating private use is provided as part of their employment. In all circumstances the employee is to be required to enter into Council?s standard leaseback agreement. ?????? Add the Australian Taxation Office?s definition of ?base value? ?????? Change ?The purchase of motor vehicles to be determined by the Manager Civil Works? to ?The purchase of motor vehicles to be determined by the General Manager? ?????? Change ?base price? and ?capital cost? to ?base value? 4???? That agreement be sought for the ?base value? of Council motor vehicles to be reduced from ?????? the current maximum of $36,000 to a new maximum of $30,000 (for either a new or second ?????? hand vehicle) and be reviewed annually. 5???? That Clause 6 of Council?s Agreement for Private Use of a Council Motor Vehicle be amended ?????? to read as follows: ?The Vehicle shall form part of Council?s car pool and shall be available for ?????? Council use during normal working hours except when the Employee is absent on approved ?????? leave (or rostered days off).? 6???? That Clause 7 of Council?s Agreement for Private Use of a Council Motor Vehicle be amended ?????? to read as follows: ?The Vehicle may only be driven by the Employee, an ? authorised officer of ?????? the Council or an Employee?s immediate family member, including learner drivers but ?????? excluding provisional licence holders (P-platers); with the exception that another licenced ?????? driver may drive the Vehicle in an emergency.? 7???? That as leases fall due for renewal, Council reverts to purchasing its motor vehicle fleet ?????? instead of leasing. 8???? That Council seek quotations from at least three licensed motor vehicle dealers in the ?????? Nambucca Valley to source good quality second hand motor vehicles at auction and arrange ?????? for their delivery to Council?s Works Depot. 1??????? Novated leases whereby the Council provides an annual cash contribution to the employee to acquire (lease) a car for both Council and private use.? The advantage of the arrangement is that all of the compliance costs and risks currently borne by Council are shifted to the employee.? The disadvantages are that the vehicle is not a Council car and would not be available for use by other employees and that Council has no control over the type of vehicle purchased. 2??????? Mandating a reduction in the base value of the motor vehicle. There would be a substantial reduction in the FBT liability if the base value of Council motor vehicles was reduced from the current $36,000.? Applying the statutory formula method for FBT and assuming an annual distance travelled of 39,000km and no contribution from the employee, the annual FBT payable on a $36,000 car is approximately $7,200 compared to $6,000 for a $30,000 car and $4,800 on a $24,000 car. The disadvantage of this option is the increased likelihood of an industrial dispute because it is effectively a reduction in the value of the employee?s remuneration package.? The Council car is usually the primary ?family? vehicle.? The majority are used for towing. 3??????? Purchasing second hand vehicles.? There is no reason why Council needs to purchase or lease new cars.? We all know that most depreciation in cars occurs when they are new.? Purchasing the equivalent vehicle second hand but still with low kilometres will mean a substantially lower base value and hence FBT liability.? The disadvantage is the cost to Council in sourcing suitable cars at auction and transporting them. Consultation with a local dealer indicates that good quality used fleet vehicles, about 2 years old with between 40,000 and 60,000 kilometres, can be sourced at auction for about 60% of their original cost.? The cost of transporting a car from Newcastle would be about $300 and an agent?s fee would need to be negotiated, probably in the range of 3.5% to 5.0%.? Those cars would have the balance of the normal 5 year new car warranty. 4??????? Attributing cost according to actual private usage.? The existing arrangements, whether they be salary package or leaseback, are not based on the individual?s private usage.? There are significant differences across the 22 vehicles in terms of the total kilometres travelled and the proportion of Council -v- private use.? For the last FBT year, the average distance travelled by Council cars was 38,520 km.? However the least distance a Council car travelled in that FBT year was 13,252 km and the greatest distance was 59,764 km.? Therefore there are significant variations between individuals in relation to their cost to Council and conversely the benefit they receive.? It is possible that Council could install tracking devices on vehicles or otherwise separately account for an individual?s private use with this being reflected in a leaseback charge.? This is not an option for current employees as increases in leaseback rates under the Local Government (State) Award 2010 are restricted to a maximum of 10% per year.? A major disadvantage would be the increase in compliance costs to determine the employee liability. 5??????? Alternatively Council can decide to maintain the status quo. The advantage is that there will be no adverse impacts on staff and no risk of industrial dispute. The disadvantage is that ratepayers will pick up the additional $65,500 cost.? There is also the possibility that Council may fall out of step with the rest of the industry and be providing arrangements for the private use of motor vehicles which are more generous than they need to be to attract quality staff.? Another risk in that Council will be financially exposed to any other sudden increases in the cost of running cars ? whether it be through taxation, petrol costs, insurance or the like. ?That these issues be considered by a report to Council regarding a more efficient way of having cars in the car pool and also report if there are more cost effective communication methods other than the use of mobile phones.? The report should address fringe benefit tax issues.? The issue concerning Council motor vehicles and FBT had already been subject of a report to Council?s Consultative Committee on 20 September 2011.? A number of proposals were put to the Consultative Committee but a decision was deferred pending legal advice from the LGSA as to Council?s legal obligations.? That legal advice has now been received and is discussed below.? ?????? Any cars purchased or leased by councils after 10 May 2011 and subsequently used by employees under vehicle leaseback agreements will be considered a ?new commitment? from the date the council acquires the car and will be subject to the new statutory formula rules.? This is? so even if there are no changes to the overarching Vehicle Lease Agreement with the employee. ?????? Any change to the leaseback fee charged to an employee after 10 May 2011 in relation to a particular car will be considered to be an alteration of a ?pre-existing commitment? that will result in a ?new commitment? from the date the change takes effect.? Accordingly, the leaseback vehicle will be subject to the new statutory formula rules for FBT purposes from this date, even if the overarching Vehicle Lease Agreement with the employee has not changed. ?????? Councils will need to consider the impact these new commitments will have on FBT costs and to what extent these costs are able to be recovered from employees. All pre-existing contracts will remain under the old statutory rates until there is a change made that would amount to a new contract. A new contract covers a new or second hand vehicle that has a vehicle purchase order, a lease contract or a finance contract entered into after 7.30 pm on 10 May 2011. As at 25 October 2011, Council has 22 motor vehicles for which it pays FBT, 14 of which are provided as part of a salary package (the employee pays no leaseback fee) and 8 that are provided under a leaseback arrangement (the employees pay a leaseback fee of between $64-$85 per week depending on vehicle type). As a result of the new legislation, it is predicted that Council?s FBT liability will increase from $46,000 this year to $111,500 in 2014 as all of the cars are changed over and the new 20% rate is applied. This is an increase of $65,500 per annum or an average of $2,977 additional cost per vehicle. Within the local government industry, motor vehicles are a standard inclusion in remuneration arrangements for professional and managerial positions and, in order to be able attract and retain staff in these roles, it is necessary for Council to continue with this practice. However, with the increasing financial liability of doing so, Council should be shifting some of the burden onto the employees who are benefitting from this arrangement. In aggregate, about half of the additional FBT liability is attributable to the private use of the motor vehicles by Council employees. Currently, Council?s (private use) vehicle fleet is comprised of a range of vehicles which meet the criteria set in Council?s Sustainable Fleet and Plant Policy ie, capital cost capped at $36061 (base value as at 31 December 2010 inclusive of GST), environmental performance score of at least 12/20 (passenger vehicles) and a minimum 4 star safety rating. There is no FBT payable on the Mayor?s vehicle as the Mayor is not an employee. The leaseback formula which has been applied is reasonably generous to staff with an assumption of 30% private usage in accordance with the LGSA?s Guidelines for Providing Cars. Council?s current leaseback fees have been compared with other councils. From the table 4 below it is apparent that Council?s minimum leaseback fee is about average whilst the maximum leaseback fee is slightly below average. 3??????? leaseback vehicle fees generally cannot be increased in any one year by more than 10% or the percentage movement in the index figure published by the Australian Bureau of Statistics for Eight Capitals, private motor sub-group (Cat No 6401.0), whichever is the greater. The exception is where the leaseback vehicle fee is adjusted to reflect changes in the type of vehicle being used (including changes in vehicle options, the class, model or make of vehicle). Under the provisions of the applicable Vehicle Agreement, Council is required to give the employee one month?s notice of any adjustments to the leaseback fee. It is unclear why the LGSA agreed to the limit on increases to leaseback vehicle fees but it will impose real costs on the industry as the FBT increases plus CPI will exceed 10% per annum. The operative date for the last increase to leaseback fees was 8 November 2010. It is proposed that leaseback fees be increased by 10% per year for the next 5 years to enable leaseback fees to include a provision for FBT of $1,488 per annum or $29.00 per week, effective when the current vehicle is replaced. Council should continue with its current practice of reviewing positions as they become vacant. This means not only deciding whether to retain the position in the organisation structure but also what conditions of employment are appropriate ie, whether or not a leaseback vehicle needs to be provided.? The changes to FBT and the cost of motor vehicles is such that Council should only consider providing a motor vehicle incorporating private use if it is operationally required and/or necessary to be competitive in the labour market. There are 14 positions in Council?s structure that are provided with a vehicle as part of their remuneration package (ie at no cost to the employee): General Manager, Directors (2) and Managers (11). 1??? Council must provide a vehicle as part of the employment package conditions (in addition to the salary) for the period of employment.? 2??? The type of vehicle shall be determined by mutual agreement between Council and the employee. In relation to point 2 the agreement is silent as to a means of resolving a dispute if there is no mutual agreement. A reduction in the base value for Council motor vehicles will reduce Council?s FBT liability.? Based on the kilometres travelled by Council cars last year, the reduction in the base value would save about $1,200 per car per year or $26,400 for the whole fleet.? Obviously a greater reduction in the ?base value? would yield a greater saving but this has to be balanced against the potential costs of industrial action.? If Council changes to owning its fleet (instead of leasing) then there is no reason why there could not also be the option of purchasing good quality second hand cars, as long as they meet Council?s requirements for fuel efficiency and safety. Council should continue with its current practice of reviewing positions as they become vacant. This means not only deciding whether to retain the position in the organisation structure but also what conditions of employment are appropriate eg if a vehicle should be provided. It is proposed that any new employees in senior management roles to whom a private use vehicle is provided, be required to enter into a leaseback agreement. It is recommended that the terminology in Council?s Policy be amended to reflect that in the Australian Taxation Office (ATO) Guidelines on FBT ie ?base price? excluding GST? be replaced by ?base value? 1. In accordance with Council?s Policy Statement that adjustments be made in accordance with any changes in the NSW Government Strategy, it is also necessary to change the environment performance score requirement to 13.5/20 for passenger vehicles which is the State Government?s target for year ending 30 June 2011. ?????? Add the ATO?s definition of ?base value? All costs and charges include GST. There are two issues which require clarification/resolution within Council?s standard Vehicle Agreements for Private Use: availability of the vehicles for Council?s car pool and who is authorised to drive a Council vehicle. The current wording of the Agreement does not clearly state that when the employee is at work, the vehicle must be available for Council use ie as part of Council?s car pool.? The existing wording could be interpreted as meaning that the vehicle could be left at home with the spouse or partner, notwithstanding that the employee is as work. Whilst the Vehicle is on Council premises, the Vehicle shall form part of Council?s car pool and shall be available for Council use during normal working hours except when the Employee is absent on approved leave (or rostered days off). The Vehicle shall form part of Council?s car pool and shall be available for Council use during normal working hours except when the Employee is absent on approved leave (or rostered days off). Presently, the Agreements provide that a Council (private use) vehicle may only be driven by the employee, an authorised officer of the Council, the spouse/de-facto partner of the employee and, in an emergency, another licenced driver. For some employees, the Council vehicle is the sole or primary vehicle in the household and, for this reason, it is suggested that the relevant provision in the Agreement be broadened to include immediate family members, including learner drivers but excluding provisional licence holders. Council?s insurer has confirmed that learner drivers do not present an additional liability because they are under the supervision of a licenced driver. On the other hand, provisional licence holders do present a significant risk and therefore should be excluded. The Vehicle may only be driven by the Employee, an authorised officer of the Council or the spouse or de facto partner of the Employee, with the exception that another licensed driver may drive the Vehicle in an emergency. The Vehicle may only be driven by the Employee, an authorised officer of the Council or an Employee?s immediate family member, including learner drivers but excluding provisional licence holders (P-platers); with the exception that another licenced driver may drive the Vehicle in an emergency.? Council currently leases its motor vehicle fleet through Toyota leasing.? A review of the costs and benefits of the leasing arrangement has not produced a discernible advantage in continuing with the leasing arrangement.? There are benefits in removing some administrative burden from the Finance Section but equally there is additional administration for the Workshop in invoicing Toyota for standard servicing.? Also the proposal to allow the purchase of good quality second hand cars could only be through ownership, not through leasing. Accordingly as Council?s motor vehicle fleet is due for renewal it is proposed to revert back to purchasing as opposed to leasing vehicles. The notice of motion also suggests petrol cards should be removed.? As previously reported, the fuel bowsers at the Works Depot were decommissioned about two years ago.? All Council plant ? cars, trucks and machinery is fuelled via petrol cards from Caltex under State Government contract.? This was done because it is both cheaper and environmentally safer than the previous practice of storing and dispensing fuel at the Works Depot. For the 1 month billing period ending 4 October 2011, Council?s mobile telephone usage account for 59 mobile telephones/simcards was $1,095 including GST or an average of $18.55 per month per mobile telephone.?? For this particular month call costs ranged from a low of $0.05 (5 cents) to a high of $202.34.? The highest charge relates to the Mayor?s laptop computer which contains a mobile simcard for wireless internet connectivity. This compares with the same monthly usage account for fixed lines of $1,111 including GST. 2.1???? You must use Council resources ethically, effectively, efficiently and carefully in the course of your official duties, and must not use them for private purposes (except when supplied as part of a contract of employment). a)???? Minimal use of telephone, email, internet or faxes for private purposes will be permitted.? b)???? Occasional use of photocopier may be permitted with the consent of your supervisor.? ?If the mobile phone is primarily for use in the employee?s employment, the benefit is an exempt benefit?. This report is to be considered by a meeting of the Consultative Committee to be held before the Council meeting.? The minutes of the meeting will be available before the Council meeting. Council?s Sustainable Fleet and Plant Policy adopts the State Government?s environment performance score requirement of 13.5/20 for passenger vehicles. This means that Council keeps in step with the endeavours of the public sector for reduced fuel consumption and greenhouse emissions. There are no significant social implications. There is a risk that industrial action will ensue if the affected staff believe their employment benefits are being eroded and the changes are unreasonable. Equally there is a risk to Council?s reputation in the community if it does not control operational costs. Financial modelling undertaken by Council?s Finance Officer based on the distances travelled by the 22 motor vehicles in the FBT year ended 31 March 2011, indicates that Council?s FBT liability for motor vehicles will increase from $46,000 this year to $111,5000 in 2014 as all of the cars are changed over and the new 20% rate is applied. The recommended changes in this report will save $38,304 on Council?s FBT bill based on current usage patterns.? With the reported redundancy of the Manager Planning & Assessment and other vacant positions there is an opportunity to achieve further savings if the number of motor vehicles can be reduced or at the very least through the substitution of ?salary packaged? motor vehicles with ?lease back? motor vehicles. At this stage there is no impact on working funds.? The increased FBT liability and the offsetting recommendations in this report will be incorporated in Council?s future budgets. The report is brief.? A summary is not required. That the information concerning the Local Government Amendment Bill 2011 be received. The legislation has been introduced to Parliament without any consultation with Councils.? Council can make representations to the Minister if it wishes. On 12 October 2011 the Hon. Donald Page, NSW Minister for Local Government gave notice of a motion to introduce the Local Government Amendment Bill 2011 to the NSW Legislative Assembly.? As yet there has been no circular from the Division of Local Government in relation to the proposed legislation. (g)? to enact provisions of a savings or transitional nature. The changes in relation to (e) reduce, from 3 years to 1 year, the period for which special arrangements exist for non-senior staff of councils that are affected by the constitution, amalgamation or alteration of council areas.? The special arrangements relate to forced redundancies and the appointment of new positions on the staff of a council. other than a senior staff member, must not be terminated, without the staff member?s agreement, within 3 years after the transfer day on the ground of redundancy arising from the staff transfer. There are similar provisions in relation to the lateral transfer of non-senior staff under Section 354G. The effect of the changes to Section 354F will be to reduce the transitional costs of amalgamations or boundary adjustments.? This will come at the expense of the time provided to non-senior staff to find alternative employment.? Compared to the private sector, the 3 year provision is quite generous.? The proposed 1 year provision is closer to the norm for major structural change in an industry.? Senior staff contracts currently provide for a lesser period of notice being 38 weeks. The provisions have transitional arrangements whereby the 3 year provision will continue for existing staff.?? The one year provision will only relate to new staff.? In the event of any structural change by amalgamation or the like, the mix of existing staff on 3 year provisions and newer staff on a single year provision is likely to complicate the establishment of a new organisation structure. The report has been referred to Council?s Consultative Committee for comment.? The Committee is meeting on 2 November and the minutes will be available for this meeting. The displacement of staff through amalgamations or the like will have social costs. The displacement of staff through amalgamations or the like may have economic costs.? This will be dependent upon the nature of the change. There are no particular risks for Council. A summary is not required.? The report is brief. That Council thank the United Services Union for their support of NSW local government and for their concerns for its future.? Further, the Union be advised that until such time as reform proposals are put to Councils it would be premature to respond to the survey. Council can respond to the survey if it wishes. Council has received the attached letter from the United Services Union (USU).? The Union identifies a number of issues of concern arising out of the Destination 2036 report from the recent 2 day forum for Mayors and General Managers at Dubbo.? It also seeks feedback on Council?s position in relation to discussion points at the Dubbo forum and other topical issues including the rationalisation of water utilities and the potential tendering of main road maintenance.? The latter is a major source of funding for many NSW rural councils (but not the Nambucca). Some of the questions are reasonably generic in nature and require that consideration be given to the trade-off between efficiency?v-local democracy; or efficiency?v-local employment.? Neither the letter nor the survey acknowledges the very large differences in the size, capacity and responsibility of councils across NSW.? A preferred outcome which balances efficiency and local democracy for say a Sydney Council will not necessarily be applicable to a rural council.? In fact the major agreement from the Dubbo forum was that there can?t be a ?one size fits all? solution. It would be premature to respond to the USU?s survey until reform proposals are put to Councils.? At that time the Council would be able to make a judgement in relation to the trade-offs discussed above and provide advice to the Union as to its position. There has been consultation with General Managers from the MIDGOC Councils.? The general view is that the respective councils won?t be responding to the survey for similar reasons to those discussed above. The report will be considered by the Consultative Committee meeting on 2 November 2011. There are no issues for the environment. There are no social issues. There are no economic issues. There are no particular risks. There is no impact on budgets. It is a short report.? A summary is not required. That the WorkCover Authority of NSW be invited to review the Macksville Saleyards and the Saleyard Risk Assessment and provide advice on what they believe is reasonably practicable in order to satisfy Council?s obligations under the Work Health and Safety Act 2011. Council can elect to not adopt the recommendation.? However without some final determination being made as to the minimum work required at the Macksville Saleyards, Council won?t be able to undertake any financial planning.? Without knowing the minimum work required it may also make more difficult or delay any potential transfer of the Showground to the Nambucca River District Agricultural Association.? There is also the risk that in the event of an accident, and Council having been made aware of non-compliance through the risk assessment by Holmes and Black, that Council?s insurers may decline a claim.? This may also be a factor in any potential prosecution by WorkCover. The other option is that Council seek another independent audit report.? The cost for such a report is likely to be in the vicinity of $10,000.? If the report contains recommendations which are inconsistent with the report from Holmes and Black, the Council will have a dilemma.? If the report contains similar recommendations to those from Holmes and Black it is likely to be subject to the same criticism. In the consideration of the reports on the future of the Macksville Saleyards, including at Council?s meeting on 6 October 2011, there has been considerable discussion about the accuracy or otherwise of the risk assessment undertaken by Mr John Black from South Eastern Workplace Safety and Mr Gerry Holmes.? Mr Black is a National Saleyards Induction Trainer who has undertaken work for a number of saleyards including Cowra, Moss Vale and Goulburn.? Mr Holmes is a solicitor and barrister with particular expertise in local government. ?6.????? That WorkCover be invited to review the Saleyard Risk Assessment and to provide advice on what they believe is reasonably practicable in order to satisfy Council?s obligations under the Work Health and Safety Act 2011.? In terms of Council?s financial planning and presumably the due diligence which is to be undertaken by the Nambucca River District Agricultural Association Limited, it is important that a determination be made as to the minimum level of work which is required to be undertaken so that the Saleyards are legally compliant.? There may well be additional work which is agreed should be done, but the first step is to finally determine the minimum level of work to achieve compliance with OH&S standards. Rather than engage another contractor to provide an audit report on the Saleyards and potentially have the same criticism of its recommendations, it is proposed that WorkCover be invited to review the Saleyard Risk Assessment and provide advice on what they believe is reasonably practicable in order to satisfy Council?s obligations under the new Work Health and Safety Act 2011.? The new Act changes the previous Occupational Health and Safety Act to place an obligation on WorkCover to provide this assessment. As WorkCover is ultimately responsible for actioning any non-compliance with OH&S requirements at the Saleyards, it is logical that they be invited to provide advice on any aspects of non-compliance which would have to be attended to by either Council or the Nambucca River District Agricultural Association Limited should they agree to acquire the Showground. There has been consultation with the Property Officer, Manager Business Development and Safety and Risk Officer. The Office of Environment and Heritage have to approve any effluent disposal system.? The investigation by the WorkCover Authority of NSW would be in relation to occupational health and safety matters. There are no social implications arising out of the recommendation. There are no economic implications arising out of the recommendation. The purpose of the recommendation is to finally determine the work required at the Macksville Saleyards so they are compliant with occupational health and safety legislation. There is a risk that WorkCover will issue Council with a provisional improvement notice requiring work to improve safety at the Saleyards.? Council can make representations about the work identified in the notice and also the period in which the work has to be undertaken. Council has to balance the risk of incurring expenditure as a result of a provisional improvement notice against doing nothing and then facing unplanned and unfunded expenditure at a later date.? There is also the risk that in doing nothing Council may not have insurance coverage and face larger penalties in the event of an accident. It is expected that WorkCover will provide their assessment at no cost to Council. AUTHOR/ENQUIRIES:???? Steven Williams, Property Officer ???????? United Christian Broadcasters (UCB) have requested a licence to occupy and use part of the water reservoir infrastructure at the Bellingen Street reservoir, Nambucca Heads, the Wallace Street reservoir, Macksville and the Herborn Drive reservoir at Bowraville. Council has previously granted licences and/or leases to these facilities for installations such as Telstra and Optus mobile phone towers and radio cab antennae and transmitters. In this instance Council has previously resolved to grant a lease to UCB for the installation of FM radio equipment on the Bellinger Street Reservoir (03/02/2005) however this matter did not proceed.? The Manager has advised that whilst his preference is for no further installations to be erected on the facilities he has no objections to this proposal provided all necessary OH & S issues are adequately addressed.? The Manager also suggests that Council prepare a policy to manage future leasing and licensing arrangements on Water Reservoirs to ensure that a consistent approach is taken to potential future requests. Having regard to the above it is recommended that Council grant a licence to the UCB for each installation on terms deemed necessary by Council?s legal advisor. 1????????? That Council grant a licence for a period of 5 years to United Christian Broadcasters to install and operate an FM transmitter on the Bellingen Street water reservoir, Nambucca Heads for the purposes of relaying radio programs for the Vision FM station on terms deemed necessary by Council?s legal advisor or as agreed between the parties. 2????????? That Council grant a licence for a period of 5 years to United Christian Broadcasters to install and operate an FM transmitter on the Wallace Street water reservoir, Macksville for the purposes of relaying radio programs for the Vision FM station on terms deemed necessary by Council?s legal advisor or as agreed between the parties. 3????????? That Council grant a licence for a period of 5 years to United Christian Broadcasters to install and operate an FM transmitter on the Herborn Drive water reservoir, Bowraville for the purposes of relaying radio programs for the Vision FM station on terms deemed necessary by Council?s legal advisor or as agreed between the parties. 4????????? That the General Manager and the Mayor be authorised to conclude negotiations between the Council and United Christian Broadcasters on the licence fee and terms of the proposed license for the installation of FM transmitters by United Christina Broadcasters to the Bellingen Street, Wallace Street and Herborn Drive water reservoirs and that the Council seal be authorised to be affixed to the licence documents as necessary. 5????????? That prior to the terms of the lease being finalised United Christian Broadcasters shall be required to engage an independent EME consultant to undertake an assessment of the proposed installation to ensure that the OH&S conditions on site are not compromised and to update or produce a new Radio Communications Site Management Book on completion of the installation. 6????????? That the installations are installed in accordance with the EME consultants recommendations with minimal impact on water supply operations and maintenance activities and to the approval of Council?s Manager Water and Sewerage. Council can elect to decline the issue of licence entirely or until the proposed policy is adopted. United Christian Broadcasters (UCB) are a registered non profit charity which produces and broadcasts Vision FM to an audience sponsored non denominational Christian FM radio station. UCB reports that they currently broadcast through almost 200 relay stations across Australia. UCB seeks to expand this coverage into the Nambucca Shire. The Vision FM program is transmitted from Brisbane via satellite and downloaded to the local area by a domestic satellite dish. This signal is then passed through a decoder and 1 watt transmitter and rebroadcasted via a 2.8 metre fibreglass whip antenna. UCB has submitted plans for the instillation of the equipment which are to the satisfaction of the Manager Water and Sewerage subject to compliance with current OH & S requirements. Electromagnetic Radiation (EMR) safety issues were of particular concern to the Manager Water and Sewerage.? UCB have undertaken to comply with all safety requirements and standards regarding EMR emissions, notwithstanding the relatively insignificant output compared to major commercial FM radio broadcast (quoted by UCB at 10watts and 20,000watts respectively). An important component of RF safety compliance is the availability of site safety documents.? A Radio Communication Site Management Book (RCSMB) is the principal document used to demonstrate compliance of the site from an RF perspective.? It contains site specific information about the RF installations on site, levels of EMR and the potential hazards at the site. Any new installations should be included in an updated or new copy of the RCSMB. In 2009 Council staff obtained an independent market appraisal for licence rental for FM antenna similar to that proposed.? At the time market rent was assessed at $450.00 per annum. More recent cost accounting for the administration of licences however indicates that the annual administration cost of a licence of this type over a five year term equates to approximately $1,033 per annum.? This accounts for costs such as preparation, drafting, reporting and negotiating the licence, reviewing the agreement and inspecting the licence site, conducting risk assessments on the license site and preparing issuing and receipting accounts and statements.? Accordingly, and notwithstanding the 2009 market rent appraisal it is recommended that each licence fee be set at not less than $1033 per annum (plus GST). Should Council seek to increase net revenue for the proposed licences then a higher fee would be required. All costs associated with the installation and maintenance of the equipment will be the responsibility of UCB. Legal fees incurred to draft the agreement, if not compiled in house, will be the responsibility of UCB. Provision of the UCB radio broadcast can be viewed as further service to the local community. The recommendations do not give rise to any economic issues. Future budgets will be affected by the licence fee.? Should Council elect to at least cover administration cost the effect will be neutral. Otherwise a net contribution to revenue will accrue. Administration costs will be included in future budgets. A Position Paper has been prepared on proposed changes to the Model Code of Conduct.? Whilst the Position Paper indicates that no major changes are proposed to the standards of conduct prescribed, there are many proposed procedural changes.? The report summarises the most significant of the proposed changes. That Council make a submission on the Position Paper for the Review of the Model Code of Conduct suggesting that the proposal that Councillors should not meet with developers alone to discuss development applications or proposals be reframed to the effect that Councillors should not meet with any person or group alone to discuss a development application or proposal. If this suggestion is not accepted by the DLG, then it be requested to define a ?developer?, a ?meeting? and a ?proposal?. Council can make a submission in relation to the proposals in the position paper. The Division of Local Government (DLG) has circulated a position paper on the review of the model code of conduct. A copy of the circular and position paper has been circularised to Councillors. There have been a number of cases where councils have lost a quorum as a result of the need for a majority of Councillors to comply with a requirement of the Model Code in relation to the disclosure and management of non-pecuniary conflicts of interests or an interest arising from the receipt of a political donation. The DLG proposes to include a provision to enable Councillors to apply to the Chief Executive of the DLG to be exempted from a requirement to comply with a provision of the Model Code. The DLG propose to add another paragraph that in effect provides that Councillors should not meet with developers alone to discuss development applications or proposals. Whilst the intent of the provision is understood and agreed, it could be problematic.? A ?developer? can potentially be any applicant.? However there is no similar provision in relation to a person or group which may be equally intent on the opposite outcome, ie that Councillors refuse a development application.? In a smaller community it can also be difficult to avoid ?meeting? either ?developers? or ?objectors? in the normal course of life. It is proposed that Councils should require contractors, their employees and subcontractors to comply with the relevant provisions of the code of conduct under the terms of the contract they enter into with the Council.? Councils should also require volunteers to comply with relevant provisions of its code of conduct as a condition of their appointment. These changes will likely result in increased induction costs for both contractors and volunteers.? It may be more difficult to recruit volunteers. It is proposed that Regional Organisations of Councils (ROCS) constitute a regional panel of conduct reviewers for use by their constituent Councils. It is proposed that the general manager be required to nominate a senior and suitably qualified member of staff to serve as a ?complaints coordinator?.? The general manager may not perform this role.? The position would coordinate the management of complaints under the Council?s code of conduct. Councils will be required to nominate by resolution the general manager of another council in the regional group of Councils to serve as the council?s complaints assessor and one or more others as an alternate to that role. The role of the complaints assessor will be to make a preliminary assessment of complaints. An advantage of this arrangement is that the preliminary assessment will be made by a person (General Manager) independent of the council to which the complaint relates to.? A disadvantage is that the council will have no control over the management of the complaint and particularly the costs which might be incurred in dealing with it. It is proposed to remove the option of referring a matter to a conduct review committee of three or more persons.? Under the proposed amendment, the Model Code procedures will only provide for the referral of matters to sole conduct reviewers.? It is indicated that this is to save costs. It is proposed to make the provisions relating to the procedures conduct reviewers are required to follow in investigating a matter more prescriptive.? At the outset of an investigation, the reviewer will be required to provide a written ?notice of investigation? to the person the subject of the investigation.? This notice must disclose the substance of the allegations; the relevant provisions of the code of conduct that apply to the alleged conduct if proven; advise of the process to be followed in investigating the matter; invite the subject person to make a written submission; and provide the subject person with an opportunity to personally address the conduct reviewer. It is proposed to add an additional sanction being that the council may request that the Director General suspend a councillor for misbehaviour. This report will go to the Consultative Committee on 2 November 2011. The proposed changes to the Code of Conduct make it a more prescriptive process with an increased risk of unintended procedural errors and increased direct and indirect costs.? The DLG will also have a more active role in how Councils deal with Code of Conduct complaints which may also have some unintended consequences. A more prescriptive process could also make the day to day business of being a councillor more difficult as the general public is unlikely to have any knowledge or appreciation of the proposed constraints on association (meetings). For this Council there is a financial risk that the cost of complaint investigation will increase as Council will need to conform with the referral standard established by its regional group of Councils.? To date this Council has not spent any funds on an external conduct reviewer.? Some councils have incurred significant expenditure on Code of Conduct investigations involving external reviewers. At this stage there is no budgetary impact.? It is foreshadowed that the cost of investigating Code of Conduct complaints will likely increase as an informal ?standard? for referrals will likely be established and then applied across the group of councils.? As this Council has not incurred any direct costs in investigating Code of Conduct complaints it is difficult to foresee the cost of regional processing being anything but more expensive. AUTHOR/ENQUIRIES:???? Joanne Hudson, Manager Human Resources ???????? An offer of voluntary redundancy has been made and accepted and, as a result, it is recommended that the position of Manager Planning and Assessment be deleted from Council?s organisation structure. It is further recommended that Council defer its decision on replacement of the Manager Planning and Assessment position with another, lower-graded position or otherwise, until completion of the independent organisation review in late November 2011. There are also a number of other positions currently vacant which present Council with an opportunity to review the organisation structure without incurring forced redundancies. It is recommended that no further action be taken in relation to current vacancies until completion of the independent organisation review. 1??????? That the position of Manager Planning and Assessment be deleted from Council?s organisation structure. 2??????? That Council defer its decision on replacement of the Manager Planning and Assessment position with another, lower-graded position or otherwise until completion of the independent organisation review. 3??????? That no further action be taken in relation to current vacancies until completion of the independent organisation review. Manager Planning and Assessment - Council can decide not to replace the position at all, replace it with another, lower graded position or defer its decision until the independent organisation review is complete. The position, at its current status, cannot remain in the structure as a redundancy has been accepted. Other vacant positions ? Council can decide to continue with recruitment action, suspend action or take no further action. 3???? There would be savings (in salary, salary on-costs, vehicle expenses and FBT) that could be utilised ????????? elsewhere. The offer of voluntary redundancy was made on 12 August 2011 and subsequently accepted with the incumbent ceasing employment on 2 November 2011. It is proposed that the position of Manager Planning and Assessment be deleted from Council?s organisation structure and that any decision regarding replacement of the position with another, lower-graded position or otherwise be deferred until completion of the independent organisation review. (With regard to the review timeline, the LGSA expect to have the report finalised on 24 November 2011 for distribution to Councillors ahead of a workshop to be held on 29 November 2011). This position is currently vacant and has been advertised; however, recruitment action has been suspended until completion of the independent organisation review. This position is currently vacant and has been advertised; however, recruitment action has been suspended until completion of the independent organisation review.? Following the review, if it is determined to re-instate the Director Corporate Services position, a cost-saving offset would be to delete the Cadet Accountant from the structure.? The two reasons for this are that the Director will be responsible for some of the finance functions and secondly that funding will need to be prioritised towards the Director?s position. This position will be vacant effective 11 November 2011.? It is proposed that no action be taken (in terms of recruitment or structural change) until completion of the independent organisation review. This report will be submitted to the Consultative Committee meeting on 2 November 2011. Deletion of Manager Planning and Assessment position equates to savings of $96,000 per annum in salary and superannuation. There are additional savings in vehicle costs and FBT. The severance pay component of the incumbent?s termination pay was not specifically budgeted for but this will be offset by savings in salaries for positions that are vacant and not replaced (immediately or ever). At Council?s meeting on 7 December 2006 it was resolved that there be a quarterly return submitted to Council on grant programs. That the list of grant applications and their status to 25 October 2011 be received. The application is to fund a water theme park in Bellwood Park as proposed in the Nambucca River Master Plan.? The funding from Council would be for the replacement of the existing dilapidated toilet block. Off-river water storage (subject to a number of conditions including detailed plans, relevant approvals, Council funding, confirmation of final project costs. Completion of 350m section of cycleway between Nambucca Heads and Macksville. Mary Boulton Pioneer Cottage and Museum - Funding to conduct an assessment of the significance of the collection. Community Transport Project ? 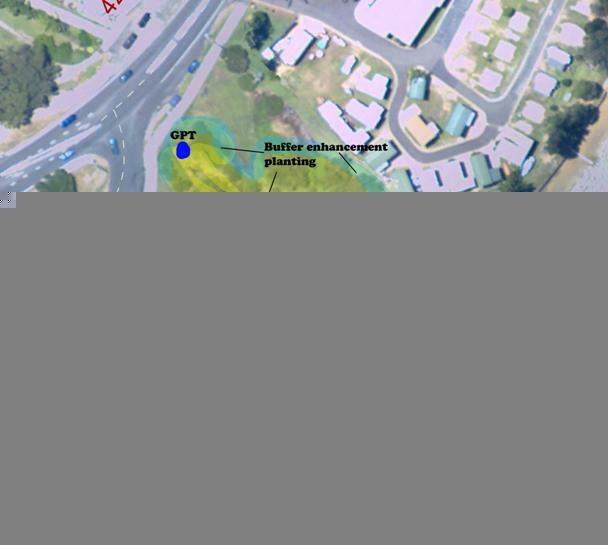 Purchase of land and building for Nambucca Heads depot. NB: Application will be made in next round in November 2011. The Grants Officer assisted a number of tourism businesses with applications for product development under the Destination NSW tourism product development grant in this period. The report acknowledges the Minutes of the Annual General Meeting of the Bowraville Folk Museum Committee of Management and the new Committee.? Copies of the Minutes of this meeting and the Financial Statement are attached. That Council endorse the Minutes of the Committee of Management for the Bowraville Folk Museum?s Annual General Meeting held on 11 October 2011 and thank the outgoing Committee for their work in the past twelve months. The Annual General Meeting of the Bowraville Folk Museum Committee of Management was held on Tuesday 11 October 2011. At Council?s meeting on 1 May 2008 it was resolved to participate in the Museum Advisor?s Program.? The program is co-funded by Museum and Galleries NSW and Council and has now completed its third year. The Museum Advisor Program provides an opportunity for Council to provide additional support via a State Government program which provides a significant (more than 50%) subsidy. It is proposed that Council continue its grant funding agreement for the Museum Advisor Program for the 2011/2012 financial year being the fourth year of the program, but advise the local museums, Museum and Galleries NSW and Ms Joan Kelly that this will be the final year of the program. That Council continue its grant funding agreement for the Museum Advisor Program for the 2011/2012 financial year being the fourth year of the program, but advise the local museums, Museum and Galleries NSW and Ms Joan Kelly that this will be the final year of the program. Council has the option as to whether it continues to fund the Museum Advisor Program for a further twelve months or not. The program is funded to run from November 2010 to October 2011 with the Advisor providing 20 days of work during this period.? Museum and Galleries NSW provide Council with $9,000 towards the Museum Advisor?s costs ($6,000 for fees and $3,000 for travel) and Council contributes $6,000. Highlights of the program in 2010-2011 was the development of a regional museum brochure, the on-going documentation of the museum collections and the development of more active and engaging audience programs including themed exhibitions. In relation to continuing the program in 2011-2012, each of our four local museums were asked to consider the achievements of the Program in 2011 compared to the objectives and the cost/benefit of the funding to the Shire.? They were also asked to advise on whether the Program should continue.? Responses from three of the museums have now been received and are attached. I met with the Museum Advisor, Ms Joan Kelly on 21 October to discuss the continuation of the program in 2011-2012.? Ms Kelly advised that if the program were to continue for a fourth year, her emphasis would be in supporting the museums in undertaking a significance assessment of their collections.? The museums contain relics with a range of significance.? In terms of developing conservation and storage strategies it is important to be able to identify the significance of each item, and particularly those items which are rare or unique to the Nambucca valley. The Museum Advisor program was never intended to be a permanent fixture in the operation of the four museums.? The museums have been developed and managed by volunteers and their future sustainability is equally dependent on volunteer labour.? The attached letters indicate that the expertise provided by Ms Kelly has been generally appreciated but ultimately the Museums have to apply that knowledge themselves. It is proposed that Ms Kelly be engaged as Council?s Museum Advisor for a fourth but final year. There has been consultation with our four museums and also the Museum Advisor, Ms Joan Kelly. The Valley?s museums are the most important means of recording, understanding and appreciating our Aboriginal history and subsequent immigrant settlement.? They are very important to understanding our identity and the forces which have shaped our settlement. There are no significant economic implications.? It should be expected that the Advisor will make some positive contribution to the display and marketing of exhibits which should have a positive impact on tourism and Museum visitation. There is no discernible risk. Provision has been made in the draft budget for 2011/2012 for the funding for this program. The report acknowledges the Annual General Meeting of the Argents Hill Hall?s Committee of Management and the new Committee. ?Copies of the Minutes of this meeting, which was conducted on Monday 17 October 2011, are attached. That Council endorse minutes of the Committee of Management for Argents Hill Hall?s Annual General Meeting held on 17 October 2011, and thank the outgoing Committee for their work in the past twelve months. The AGM of the Argents Hill Hall Committee of Management was held on Monday 17 October 2011. That the Macksville RSL Sub-Branch be advised that Council supports the establishment of a War Memorial in the River Street foreshore park as per the circularised plan subject to grant funding being provided for the work. Council has previously considered other options for the site of a War Memorial being at the entrance to the Council administration building and also beside the Macksville library.? A prominent location in the redeveloped River Street foreshore park is the location preferred by the Macksville RSL Sub Branch. For a number of years, the Macksville RSL Sub Branch has been investigating a site for a new War Memorial in Macksville. A letter from the Macksville RSL Sub-Branch and a related report to Council?s meeting on 20 March 2008 is attached. Mr Roger Jones on behalf of the Macksville RSL Sub-Branch has now proposed that a War Memorial be located in the foreshore park off River Street.? The suggested location is shown in the colour plan which has been circularised to Councillors. Besides being a prominent and fitting location to honour the sacrifices made by our veterans and service people, it will also allow the Anzac march to be conducted without any temporary road closure of the Pacific Highway.? The highway closure is becoming increasingly difficult. For the major Anzac Day services it will be necessary to undertake a temporary road closure of the section of River Street between Wallace Lane and Princess Street.? For smaller services it would be possible to conduct them without a road closure with the attendees in the park belong the proposed memorial. The establishment of the new memorial will be subject to funding being made available by the Federal and/or State Governments. When the new memorial is established it is suggested that the hitherto un-named foreshore park be named as the ?Macksville Memorial Park?. There has been consultation with the Macksville RSL Sub-Branch, the Director Engineering Services and Council?s Engineering Designer. A well located and designed memorial is important for a town?s identity and to afford the opportunity for the community to reflect on the sacrifices made by those serving our community and nation. There are no significant economic implications.? Temporary road closures of a section of River Street will be required on Anzac Day which may affect some businesses in River Street which remain open on Anzac Day.? However this will be balanced by the large crowd which will attend the ceremonies. From discussions with the Sub-Branch it is understood that they are to seek funding for the design and construction of the memorial. The Council has received a request from the Macksville RSL Sub Branch to nominate a preferred location for a proposed town memorial.? The report discusses the options put forward and recommends that the Sub Branch be advised that Council?s preferred sites are either in or around Dawkins Park or on the riverbank on or near the end of Princess Street. That the Macksville RSL Sub Branch be advised that Council?s preferred sites for a proposed town memorial are either in or around Dawkins Park or on the riverbank on or near the end of Princess Street. All 4 sites listed by the Macksville RSL Sub Branch are potential options. Council has received the attached letter from the Macksville RSL Sub Branch. From a previous meeting involving the Mayor, General Manager and representatives of the Macksville Sub-Branch it is understood that the Sub-Branch is seeking a larger and better located memorial than the one which currently exists on the western boundary of the Club?s car park.? Another consideration in locating the memorial is the ANZAC procession and where possible avoiding the Pacific Highway. There are a number of potential sites in and around Dawkins Park.? Consideration needs to be given to the possible future expansion of the Macksville library but otherwise the area has no apparent constraints.? Being located on Princess Street, it is a good location for the termination of the ANZAC procession.? The location is also the ?civic? heart of Macksville and a fitting location for a war memorial. One specific option which has been considered is at the front of the Senior Citizens Centre just to the south of the existing flag pole.? There is adjacent on and off street parking with disabled access.? Further consideration of this option would require consultation with the Committee of Management for the Senior Citizens Centre. The provision of a memorial in Dawkins Park is a permissible land use in the 6(a) Public Recreation zone. The entry arrangement to the Council Chambers readily lends itself to a memorial.? As the most important civic building in Macksville with high visitation it is also a fitting location.? Again there is adjacent on and off street parking with disabled access.? There is also a reasonable area to the east of the dwarf wall for a large congregation of people.? However if the Council offices were to ever move, for whatever reason, the memorial may need to be relocated. There is an existing small memorial for Frank Partridge VC in this location.? Whilst there is a good supply of off and on-street parking in the immediate vicinity, the available area is somewhat fragmented by the existing shelters and trees.? There is also the problem of processions crossing the Pacific Highway. This is another potentially desirable location with ample on and off street parking available in the immediate vicinity.? Whilst flood liable, this location has high amenity and visitation.? A potential memorial location would be adjacent to the wharf or at the end of Princess Street where it meets the river.? The foreshore park is unzoned being part of River Street. At this stage there has only been consultation with the Sub Branch.? If a preferred site is identified there will need to be further consultation with any relevant Committee of Management or user group in relation to the location and proposed memorial. There are no risk issues. That Council make urgent and persuasive representations to its Local Member and Deputy Premier the Hon Andrew Stoner MP as well as the Roads and Traffic Authority that the Nambucca Heads to Urunga upgrade of the Pacific Highway be the next section of Highway which is committed to construction. It is open to Council, what, if any, representations it may make to the Roads and Traffic Authority and the State Government. On 27 October 2011 Cr Finlayson, the General Manager and Director Engineering Services met with Mr Jim Campbell (acting Director of the Pacific Highway Group) Mr Shane Green and Mr Chris Clarke of the Roads and Traffic Authority (RTA) to discuss the progress of the Pacific Highway upgrade and in particular the recent announcement to review the alignment of an 8 km section across the Nambucca River floodplain.? The Mayor was unavailable to attend the meeting and asked that the Deputy Mayor attend.? The Deputy Mayor had a conflict of interest and in turn arranged for Cr Finlayson to attend. As Councillors are aware, the Government has instructed the RTA to review an 8 km section of the approved alignment between Bald Hill, just to the south of Macksville, and Old Coast Road adjacent to the Kingsworth Estate.? A technical review committee has been established to undertake this review and it is anticipated that the necessary technical information for the review should be collated by the end of 2011.? What happens after that depends on the outcome of the review, but if it is found preferable to change the alignment of the Highway then there will be considerable work required in amending the environmental assessment and seeking a modified approval under Part 3A. A copy of the plan showing the route being investigated is circularised for Councillors? information.? It is obviously a longer crossing of the floodplain but does avoid the acquisition of houses on Old Coast Road.? Council staff have also received concerns from residents of Kingsworth Estate who are concerned with the Highway alignment moving closer to their houses.? The RTA representatives advised that they propose to have two projects between Port Macquarie and Raleigh which can be delivered for construction in the immediate future.? They have already made a commitment that one of these projects will be the 26 kms between Frederickton to Eungai.? The remaining project will either be a section between Kempsey and Port Macquarie or Nambucca Heads to Urunga.? Given the poor safety record of the section between? Nambucca Heads and Urunga it is important for Council to express its strong support for this section to proceed to construction as the second project.? The Nambucca Heads to Urunga section is also of strategic importance to the Nambucca Valley in providing a needed truck stop and also to provide access to the Valla growth area.? The RTA has decided that the Warrell Creek to Urunga section would not be delivered as a single project and hence, with the review of the 8 km section between Bald Hill and the Kingsworth Estate, the section from Warrell Creek to the Nambucca Heads interchange would be delivered as a subsequent stage. The Warrell Creek to Urunga upgrade of the Pacific Highway has already been subject to extensive environmental assessment and has received Part 3A approval. It is in the interest of the Nambucca Valley that the upgrade of the Pacific Highway proceed as quickly as possible. It is in the economic interest of the Nambucca Valley that the upgrade of the Pacific Highway proceed as quickly as possible.? It is difficult to quantify the economic benefit but besides the substantial number of jobs created in construction there will be substantially reduced travel times for our residents and businesses. There are no particular risks in relation to the recommendation. There are no budgetary impacts. AUTHOR/ENQUIRIES:???? Emma Shaw, Administration Support Officer ???????? d??????? to provide Council with advice in regards to eco-tourist facilities. ??????????? a???? Allow ?Tourist and Visitor Accommodation? as permissible with consent in the RU1 Primary Production, RU2 Rural Landscape and R5 Large Lot? Residential Zones but prohibit the land uses ?backpackers accommodation?, ?hotel and motel accommodation? and ?serviced apartment?. ??????????? b???? Limit the size of secondary dwellings to 50% of the size of the Primary Dwelling. ??????????? c????? To allow secondary dwellings as a use that is permitted with consent within the RU1 Primary Production and RU2 Rural Landscape Zones. 2????????? That, pursuant to Clause 55 of the Environmental Planning and Assessment Act 1979, Council staff prepare planning proposals that give effect to the above proposed amendments in accordance with Clause 56 of the Act, the Planning Proposals be forwarded to the Minster for Gateway Determination. 3????????? That in the event that the Department of Planning and Infrastructure require minor changes or modifications to the above resolutions, the General Manager be authorised to concur with the required changes provided Council's intent in the above resolutions are achieved. That Council not proceed with one or all of the proposed amendments. The Nambucca LEP 1995 allowed a ?Rural Tourist Facility? to be undertaken on Rural Land. ?Under this definition Council could accept applications for detached tourist facilities such as tourist cabins. The definitions which most closely achieve the intent of a rural tourist facility under the Standard Instrument LEP template were ?farm stay accommodation? and ?bed and breakfast accommodation?.? Both these land uses were incorporated into the Nambucca LEP 2010 as permissible uses in the rural zones to capture activities previously permissible as a rural tourist facility. An amendment to the Standard Instrument Order on 13 July 2011 varied the definition of Bed and Breakfast Accommodation within the Nambucca LEP 2010.? This recent change to the definition of Bed and Breakfast Accommodation has resulted in the Nambucca LEP 2010, not permitting activities such as tourist cabins in rural zoned land unless it is related to primary production. Tourism in the Rural areas of the shire has the potential to create a positive contribution to the local economy. One of the potential risks of allowing this type of development is the mis-use of tourist accommodation as dwellings, particularly where a dwelling entitlement is not available. 1????????? Council allow ?Tourist and Visitor Accommodation? as permissible with consent in the RU1, RU2, R5 Zones but prohibit the land uses ?backpackers accommodation?, ?hotel and motel accommodation? and ?serviced apartment?. By preparing the land use tables in this way all tourist accommodation except those prohibited will be permissible uses. This is a similar approach used by other Councils including Bellingen Council. ????????? That Council defer the inclusion of ecotourism as a permissible land use with consent in zones RU1, ????? RU2, R5, SP3, RE1 RE2 and E3 until a definition is provided. The ?eco-tourist facility? definition was introduced into the standard instrument in July 2011 and has the following meaning. c.???????? is sensitively designed and located so as to minimise bulk, scale and overall physical ???????? footprint and any ecological or visual impact. It may include facilities that are used to provide information or education to visitors and to exhibit or display items. If this definition is introduced as permissible with consent in any zone then it is compulsory to introduce the following clause that would apply to any proposal for an eco-tourist facility. b.???????? to provide for sensitively designed and managed eco-tourist facilities that have minimal ????????????????? impact on the environment both on and off-site. 2.???????? This clause applies if development for the purposes of an eco-tourist facility is ???????????????????? permitted with development consent under this Plan. ??????????? v??????? maintaining improvements on an on-going basis in accordance with relevant ISO ???????????????? ?? 14000 standards relating to management and quality control. ?????????????? Should Council allow Eco-Tourist Facility Developments in Environmental Zones those zones would be subject to additional development potential not presently available. This is because at present the only type of accommodation available in the Environmental Zones is Bed and Breakfast Accommodation. Secondary Dwellings were introduced into the NSW Planning System as a way of promoting alternative forms of affordable housing (Granny Flats).? To achieve this, secondary dwelling provisions were written into the SEPP Affordable Rental Housing and the Standard Instrument Local Environmental Plan.? When initially made the Nambucca LEP 2010 contained provisions which allowed secondary dwellings to be constructed to 50% of the size of the primary dwelling. ??????????? (b) 100% of the total floor area of the principal dwelling. ?????????????? The objectives of the secondary dwelling provisions to provide alternative forms of affordable housing would not be achieved. That the intent of the provisions to provide granny flats would become redundant. ?????????????? In R5 Large Lot Residential areas a person may undertake a detached dual occupancy type development which was not previously permissible. ?????????????? A person may undertake a dual occupancy type development within the R1, R2 R3, R4 zones as Complying Development under the Affordable Rental Housing SEPP. ?????????????? A person may undertake a dual occupancy type development which is not consistent with the minimum Lot Size Clause for Dual Occupancies (presently 600m2). ?????????????? These changes would also make it difficult for Council to consider other policies which may encourage affordable housing types in the Shire. For example Council could consider a reduced section 94 contribution rate for secondary dwellings, but if the secondary dwelling is the same size as a primary dwelling contribution reductions would be meaningless. ????????? (b) 50% of the total floor area of the principal dwelling. ?secondary dwellings are to be listed as prohibited development in the land use table for zones RU1 Primary Production, RU2 Rural Landscape and E3 Environmental Management? The Departments justification to prohibit secondary dwellings in rural areas was to ensure consistency with the Mid North Coast Regional Strategy and the North Coast Regional Environmental Plan. To progress the Nambucca LEP 2010 in a timely manner Council agreed to this change. Now that the Nambucca LEP 2010 has been made, further justification for secondary dwellings in rural areas is provided. Of the twenty seven (27) LEP?s made under the standard instrument provisions that contain rural zones, sixteen (16) or 59% allow Secondary dwellings in rural zones.? A number of Draft LEP?s also allow secondary dwellings in Rural Zones including Gosford City Council Draft LEP and the Hills Shire LEP.? The following table shows the LEP?s that allow secondary dwellings. In addition, the recent state government review of SEPP Affordable Rental Housing considered the permissibility of Secondary Dwellings in Rural Zones.? The review concluded that although secondary dwellings should not be made permissible in rural zones through a state provision within the SEPP, individual Local Government Areas may consider permissibility where the individual Council considers it is warranted. The reasons given by the DoPI to justify requiring secondary dwellings to be prohibited in rural zones included references to the North Coast Regional Environmental Plan and Mid North Coast Regional Strategy. It is noted that when the Nambucca LEP 2010 was made the North Coast REP ceased to apply to the Nambucca LGA, therefore its provisions are no longer applicable to LEP Amendments in Nambucca. ????????? ?Local Environmental Plans will include provisions to limit dwellings in rural and environmental ??????? zones.? Further, the Nambucca LEP 2010 limits dwellings in rural zones to Dwelling Houses; Dual Occupancies (attached) and Rural Workers Dwellings. Permitting secondary dwellings restricted to 60sqm or 50% of the size of the primary dwelling is only considered a minor addition to those dwellings already permissible.? The advantages and disadvantages of allowing secondary dwellings in Rural zones are listed below. May create minor dispersed rural settlement.? The impact on rural settlement patterns is expected to be minor as the majority of secondary dwellings would be of a size that limits occupancy to 1 or 2 persons. Likely to encourage legitimate occupation of granny flats in rural areas and decrease the number of illegal occupations of rural structures. Increasing loads on existing effluent disposal systems or requiring multiple systems to manage waste.? This issue would require individual merit assessment with development applications. Council will gain contributions from structures which may otherwise be occupied illegally without Council knowledge. Over time Council receive enquiries from persons who would like to subdivide secondary dwellings onto its own torrens title. The LEP 2010 and SEPP (Rural Lands) contain adequate provisions to address this. With one of the coasts fastest growing aging populations it will provide affordable alternative accommodation for ageing rural property owners who need assistance to manage properties, but wish to retain rural lifestyle. Secondary dwellings provide space for additional family members or provide additional low cost accommodation for other persons. Provides an opportunity to supplement income by renting out the second dwelling. The provision of secondary dwellings as an additional form of residential accommodation within a single title may assist in preventing widespread and unnecessary subdivision on larger allotments. In conclusion it is expected that the impact of a secondary dwelling in a rural areas could be adequately managed through the development application process and given the proposed size restrictions on secondary dwellings, it is expected that this option would be used by landowners wishing to accommodate family members such as grandparents or children who are yet to leave home, or those looking at farm succession planning which would cater for the retiring parents/family to continue to reside on the land. It is proposed to amend Zone RU1 Primary Production and RU2 Rural Landscape to allow secondary dwellings as a use that is permitted with consent. Environmental impacts of any developments proposed as result of these amendments will be subject to an appropriate environmental assessment.? Should a proposed development appear to result in an unacceptable level of environmental impact applicants would be requested to address the issues or the applicantion could be refused. The amendments proposed through this amendment will result in a greater level of affordable housing being available in the Shire and provide opportunities for landholders to gain additional income from their properties. There is some risk that persons developing secondary dwellings in rural areas may wish to pursue subsequent subdivision of the land.? However the Nambucca LEP 2010 and the SEPP Rural Lands both contain provisions that would adequately control subdivision if it is inappropriate. The planning proposal for these amendments will be prepared in house.? Fees for advertising and notification will be sourced from the Environment and Planning advertising budget. The Our Living Coast Project is a joint initiative of Coffs Harbour City Council, Bellingen Shire Council and Nambucca Shire Council and is being funded through a $1.998m grant from the NSW Environmental Trust, under the Urban Sustainability Program. That Council note the progress of the ?Our Living Coast? sustainability initiative, that is being conducted in partnership with Coffs Harbour City Council and Bellingen Shire Council, with funding from the NSW Environmental Trust. There are several milestones that have been reached since the last update, May 2011. Nambucca Shire hosted their second Ride 2 Work day riders breakfast on Wednesday 12th October under the Our Living Coast (OLC) banner. This was a success with 14 riders showing up for a hearty breakfast at the Macksville pool. Each rider wore a Ride to Work T-Shirt, left the car at home and braved the road all in the name of sustainability. There were prizes awarded and a good media opportunity. Nambucca Shire will host, under the OLC banner, another riders breakfast for this years event. As one of the key objectives with the OLC project is for institutional change towards sustainability, Council Action learning workshops were run for indoor staff and Councillors in July. Most indoor staff and Councillors attended. Outdoor staff are to have their workshops early in 2012. Macksville and Nambucca Libraries received $5000 worth of books and DVD?s on sustainability. These books and DVD?s are for these libraries and cannot be lent to other libraries in the network. Bellingen and Coffs Harbour received the same. The Healthy Homes Program was launched in March 2011. This program aims to make house holds in the region more sustainable and resilient to the impacts of climate change such as rising power and transport costs. Households enrol in the program, attend a minimum of four community sustainable workshops and can go in the running for a community grant for up to $2000 in their area. There are T-shirts and show bags available for all participant households. Scotts Head, Taylors Arm and Eungai Creek have wrapped up their programs, with Scotts Head participants receiving; compost bins, worm farms, nesting boxes and native bee hives, Taylors Arm participants have designed a website to promote the area and the Medlow School markets and Eungai Creek have used their community grant to insulate the Eungai Creek Soldiers Memorial Hall. Bowraville is the last group to receive the Healthy homes workshop series in the Nambucca Shire. This group started their first workshop 15 October. 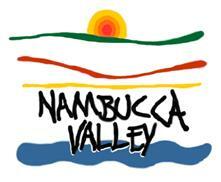 Nambucca Shire Council's on ground works program was approved by the NSW Environmental Trust on the 28 July 2011. Following on from improvement works done under the environmental levy the OLC project has paid for a consultant (GeoLink) to develop a plan of management (PoM) for Grassy (Lions) Park. This PoM will link up with Bellingen and Coffs Harbour PoM's in managing flying fox colonies in the region. There will be an overarching regional PoM developed within the new year. A community consultation workshop was run in September for residents surrounding the park.? Weeding and revegetation works have continued through winter. Locals who formed the initial Lions Park Bushcare group have continued their fantastic work with planting in of the buffer zone area close to residences. A Work for the Dole group has been tirelessly working at weeding the area. Work will still continue in the buffer zone until the Flying Foxes return for summer. After the Flying Foxes depart next year there will be weed removal, especially vine weeds, in the actual camp area, and other maintenance in the park. This project aims to enhance and protect the dune area near Wellington Rock. 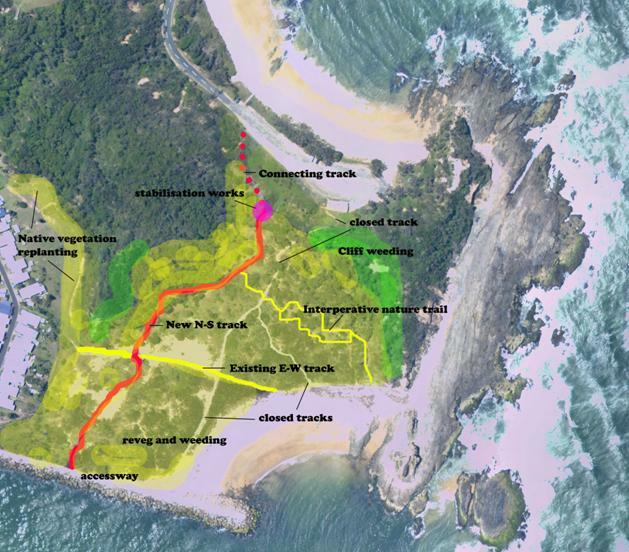 This project has come from Council's endorsed Nambucca River Foreshore Management Plan. Stage 1 is the education program for the residents of the White Albatross Caravan Park, this is a simplified healthy household workshop series that started 12 October. There is a series of 5 workshops to reinforce sustainability, these are; energy, waste, biodiversity, composting and responsible pet ownership. Park residents will also be involved in rubbish removal from the area and planting native species. Stage 2 is realigning, widening and rebuilding the walking track back from the frontal dunes to help stabilise the beach dune area, and closing some of the shortcut tracks. The east/west track from the caravan park to the intersection of the north/south track will be widened and the remainder retained as a beach access. There will be an interpretative walking track to indentify the important native vegetation. This track will better link the V Wall and Shelly Beach. Stage 3 is a weed eradication program for the area and an intensive revegetation of the old tracks and sensitive areas. Stage 4 will be installation of interpretative signage along the new walking track, and a community open day to launch the new walkway. This project aims to restore and enhance Freshwater and Beer Creeks in Nambucca Heads. This project has also come from the Council endorsed Nambucca River Foreshore Management Plan. Stage 1 Stormwater Turtle Project launch and cultural interpretation day at Bellwood Park Saturday 26th November. There will be stakeholder stalls, dreamtime talks, project overview, garbage clean up of area, native vegetation plantings, give-a-ways and drain stencilling. The aim of the Stormwater Turtle is to enhance the quality of stormwater entering the Nambucca River, especially at the swimming area for human health. Stage 2 is rehabilitating Freshwater creek, including installing a gross pollutant trap (GPT). There will be stabilisation of the beach area including beach accesses, weeding and planting of native vegetation and general landscaping. There will be continued community weeding and replanting in the area. Stage 3 is rehabilitating Beer Creek, including stabilisation works to the beach area adjacent to Anzac Park, weed removal including removal of some trees that are not native, enhancement plantings of native species. Replacement of the deteriorated timber walk bridge and enhancement of buffering plantings along the canal line up stream past the Bowling Club. There will be community planting days with members of the RSL Sub Branch and the Nambucca Heads Lions club. Stage 4 install interpretative signage. Figure 1 Wellington Rock works plan ? Extensive consultation has taken place between the three participating Councils. Representatives of the three Councils make up the Steering Committee which coordinates the Our Living Coast grant program. ?????????????? Identification of broad sustainability issues for the region within a single plan that provides clear direction based on ecological, physical and social evidence and on-going monitoring and evaluation. ?????????????? Improve urban biodiversity health (weeds, regeneration, corridors). ?????????????? Improved understanding of biodiversity and sustainability issues by key stakeholders including Councils, partners, decision-makers, the community and businesses. ?????????????? Increased capacity of councils to adopt sustainable practices. ?????????????? Reduced energy, water and waste across councils, community and businesses. ?????????????? Improved sustainable use of resources through improved management techniques within Councils. ?????????????? More use of alternative transport options. ?????????????? Improved knowledge and data management and information sharing across all stakeholders through a regional online hub. ?????????????? New and strengthened partnerships and networks across a range of stakeholders, including business and community. ?????????????? Sustainability embedded in Council systems and governance. ?????????????? Community actively engaged in participatory activities such as Landcare, Coastcare, indigenous green teams. ?????????????? Improved access, amenity and educational opportunities in urban natural areas for communities. ?????????????? Indigenous communities engaged in design and planning of education materials and on-ground works. ?????????????? Improved understanding of sustainable economic development possibilities in the region (eg ecotourism). ?????????????? Improved resource sharing (knowledge, costs) and allocation across alliance and partners group by identification of priority funding requirements. ?????????????? Reduced energy and water usage and improved efficiencies with associated costs savings. ?????????????? Funding secured for regional sustainability initiatives. The only costs incurred by Council are in kind costs. AUTHOR/ENQUIRIES:???? Neil Pengilly, Senior Health and Building Surveyor ???????? This report has been prepared for Council?s consideration and determination. Current staff Delegations restrict certain developments from being determined by staff. The restricted Delegation relates to Development Applications on land owned or under the care and control of Council?. The subject property is under the care and control of Nambucca Shire Council. The development application is for an addition to an existing awning at the Valla Beach Tennis Club, Thompson Street, Valla Beach. The awning is compatible with the use of the land and its design and construction is consistent with the existing structures on the property. The application has been assessed pursuant to the Environmental Planning and Assessment Act 1979 and is recommended for approval. 1??????? That Development Application 2011/131 for Awning Additions to the Valla Beach Tennis ????????? Club be approved subject to the recommended conditions. ????????? (e)????? Applications on land owned or under the care and control of Council with a ????????? construction value in excess of $50,000. 1??????? Council may approve the Development Application unconditionally. 2??????? Council may refuse the Development Application. The land is zoned RE 1 ? Public Recreation under Nambucca Local Environmental Plan 2010. The use of the land as tennis courts is consistent with the property zoning. The proposed development complies with Council?s Local Environmental Plan 2010 and Development Control Plan 2010. There are no relevant provisions of the North Coast Regional Environmental Plan that specifically apply to the proposed development. Facilities on the land relating to the proposed development currently include two tennis courts, club house and a small awning. The proposed awning addition is to be located between the northern tennis court and the existing club house and awning. The proposed awning is 10.3 metres in length, 1.4 metres in width with a height of 2.4 metres, with an estimated construction value of $15,000. Its design and construction of timber frame and metal roof sheeting is consistent with the existing awning. Given the minor nature of the proposed development, no adverse impacts are expected on the surrounding environs. Due to the minor nature of this application and the need to prepare and submit a report to Council for determination, it is timely to review the delegations to the General Manager regarding Development or other Applications for Certificates on Council owned or controlled land. It is suggested that the delegation to the General Manager numbered 8.4 (e) include a monetary value of over $50,000 as proposed below (bolded and underlined), to enable such minor applications to be processed without the cost and time to prepare a report for presentation to Council. (a)??????? There is a request to vary an LEP or DCP standard and there is inadequate justification for such variation. (b)??????? There is a proposed variation of greater than 10% to a maximum height standard or maximum density standard. (c)??????? There is a proposed variation of greater than 10% to a minimum lot size standard. (d)??????? The development application has been ?called in? by Council. (e)??????? Applications on land owned or under the care and control of Council with a construction value in excess of $50,000. The development application is a minor addition to an existing facility and as such no neighbour notification or internal referrals were undertaken. The proposed development is not expected to create any detrimental impact on the surrounding natural or built environment. The additional awning will provide a benefit to users of the tennis court facility without adversely impacting on the broader community. There are no significant economic implications arising from the proposed development. There is no risk to Council. The applicant proposes to seek external grants to fund the development. 1??????? The development is to be implemented generally in accordance with the plans and supporting documents endorsed with the Council stamp, dated 1/10/11 and authorised signature, and set out in the following table except where modified by any conditions of this consent. In the event of any inconsistency between conditions of this development consent and the plans/ supporting documents referred to above, the conditions of this development consent prevail. 2??????? All Plumbing, Water Supply and Sewerage Works are to be installed and operated in accordance with the Local Government Act 1993, the NSW Code of Practice for Plumbing and Drainage and AS/NZS 3500 Parts 0-5, the approved plans (any notations on those plans) and the approved specifications. 3??????? Erosion and sedimentation controls are to be in place in accordance with Managing Urban Stormwater - Soils and Construction Vol 1, 4th Edition prepared by Landcom and Development Control Plan (Erosion and Sediment Control) 2009. 4??????? Toilet facilities are to be provided, at or in the vicinity of the work site at the rate of one toilet for every 20 persons or part of 20 persons employed at the site. Each toilet provided must be a standard flushing toilet connected to a public sewer. c??????? stating that unauthorised entry to the work site is prohibited. The sign is to be maintained while the building work, subdivision work or demolition work is being carried out, but must be removed when the work has been completed. No sign is to have an area in excess of one (1) m2. a??????? Monday to Friday, from 7.00 am to 6.00 pm. b??????? Saturday from 8.00 am to 1.00 pm. No construction work is to take place on Sundays or Public Holidays. 7??????? All builders rubbish is to be contained on the site in a ?Builders Skips? or an enclosure. Building materials are to be delivered directly onto the property. Footpaths, road reserves and public reserves are to be maintained clear of rubbish, building materials and all other items. 8??????? Sediment and erosion control measures must be maintained at all times until the site has been stabilised by permanent vegetation cover or hard surface. 10????? The drainage system is to be designed for 1 in 20 year storm event and must discharge to the kerb and gutter via a suitably manufactured kerb adaptor. The pipeline located within the road reserve is to be sewer grade or equivalent. The stormwater system must be designed to comply with the requirements of AS/NZS 3500.3:2003 - Plumbing and drainage, Part 3: Stormwater drainage. 11????? All of the works indicated on the plans and granted by this consent, including any other consents that are necessary for the completion of this development, are to be completed and approved by the relevant consent authority/s prior to the issue of an Occupation Certificate. ?????????????? To ensure the development is completed in accordance with conditions of consent and approved plans. ?????????????? To provide and/or maintain an adequate drainage network that will not cause damage to existing or future development. ?????????????? To ensure that the land or adjoining land is not damaged by the uncontrolled discharge of runoff of stormwater from any buildings and paved areas that may be constructed on the land. ?????????????? To ensure compliance with engineering standards. ?????????????? To protect the environment. ?????????????? To ensure public health and safety. The purpose of this report is to advise Council of a planning proposal request to rezone Lot 1 DP805752 Egan Street Macksville from RU1 Primary Production to R1 General Residential. The planning proposal request has been made by Geoff Smyth Consulting on behalf of the land owner. ?????? the proposed residential area has insufficient area to accommodate buffers to rural land and still provide feasible residential development. a ?????? Council could support the Planning Proposal and it be forwarded to Department of Planning for a Gateway Determination in accordance with section 56 of the Environmental Planning and Assessment Act 1979. b??????? Prior to proceeding with the planning proposal the applicant be requested to address the outstanding issues identified in this report. c??????? Prior to proceeding with the planning proposal the applicant be requested to pay the scheduled fee for a rezoning application. The subject land (Lot 1 DP805752) is zoned RU1 Primary Production and is approximately 2.196Ha in size. Should this land be rezoned, then based on density of 12 Lots/HA the site has the potential to accommodate approximately 26 residential lots. In 1991 the land was subject to alleged unauthorised filling and investigation by Council. The property owner at the time advised Council that the filling was for the purposes of a stock flood refuge. At that time Council sought legal advice which determined the stock flood refuge could be considered ancillary to the agricultural use of the site and therefore did not require consent. No regulatory action was taken. Council has over 195HA of existing zoned residential land within Macksville (including infill development on lots > 1000m2). Given an approximate density of 12 Lots per Hectare there are approximately 1,774 Lots available within Macksville the majority being available at South Macksville Release Area and parcels of land at north Macksville (Uriti Road). Using an average household size of 2.4 persons Macksville has enough zoned land available for 4,250 persons. Using present average annual growth rates of 1.7%, this land should accommodate Macksville for over 20 years. In addition to this the Mid North Coast Regional Strategy has identified a growth area of approximately 77HA (2,217 persons) at South Macksville. Based on these calculations it is considered unnecessary to release any additional residential land at this point in time. There is sufficient zoned land available in Macksville for the short to medium term planning period and additional land has already be identified for release if required. Council staff will review the status of land supply when the Residential Release strategy is prepared. Section 117 Directions are required to be addressed when preparing a planning proposal. The following brief statements identify inconsistencies with the 117 directions. Although the extent of impact on the availability of rural zone is generally minor a number of matters require further consideration. ?????????????? Allowing 24 additional residential lots to adjoin a rural area may contribute to land use conflicts and the proposal does not address required buffer distances within Councils DCP 2010. ?????????????? The land presently provides flood refuge for stock, and the proposal is silent on an alternative stock flood refuge or potential cumulative impacts should a new stock flood refuge be proposed. Although the rural area affected is relatively minor in the context of the broader Nambucca Local Government Area (LGA), a number of matters have not been adequately addressed in the planning proposal. ?????????????? The proposal must be consistent with the Rural Planning Principles listed in State Environmental Planning Policy (Rural Lands) 2008. The applicant has not addressed these principles within the planning proposal and the planning proposal is not consistent with a strategy. The Planning Proposal has not adequately addressed the provisions of the of NSW coastal Policy; Coastal Design Guidelines; manual relating to the NSW Coastline Management Manual and more recent publications as required by this direction. The local planning authority cannot prepare a planning proposal relating to land use intensifications on a site unless it has considered a study into the presence of acid sulphate soils. The land is classified as class 3 and 4 acid sulphate soils and no study has been completed to accompany the proposal. ?????????????? The proposal is not identified as an agreed growth area within the mid north coast regional strategy. Councils existing Floodplain Risk Management Plan identifies that the site is affected by the 1:100 ARI flood level of approximately 3.55m AHD and the site was previously filled to a level between 3.5m and 3.6m AHD. ?????????????? The proposed dwelling floor levels should be re-evaluated in the event that future studies are adopted by Council. It is noted that the RTA in conjunction with the Office of Environment and Heritage are preparing a new flood study for Macksville and its surrounds. This flood study will take into account predicted impacts associated with climate change and the new highway. The results of this study will be available to Council, which after review will be used to update Council?s flood risk management plan. Any decision relating LEP amendments in existing flood prone land within Macksville Floodplain are considered premature until the current studies are complete. As discussed earlier in this report, there is an extensive amount of existing zoned residential land in Macksville and the majority of this land is located outside of flood prone areas, with flood free access and services. It would not be in Council's interest to pursue or encourage development in potentially constrained areas where it is unnecessary to do so. The rezoning of this land from rural to residential appears to be unwarranted at this stage. Further consideration of this matter could be undertaken when Council prepares it?s Local Growth Management Strategy - Residential Land. It is noted that the preparation of this residential release strategy is not a priority at this stage due to limited staff resources and the fact that new flood modelling is presently being prepared for the Nambucca LGA. Once the new flood study is completed, the preparation of the Local Growth Management Strategy Residential Land may be afforded a higher priority. The subject land has been cleared and filled in the past. The cumulative environmental impacts of any future development on the site would need to be addressed. It is anticipated that adjoining residents to this land would not support an application for rezoning as it would impact on their present rural outlook. Increasing the density of dwellings in the Egan Street area would be likely to place additional pressures on emergency services to ensure the safety of residents during flood events. Progressing this proposal prior to the finalisation of the new flood study and Local Growth Management Strategy - Residential Land may incur costs that cannot be justified. If Council supports an LEP amendment at an inappropriate location or prior to the up to date information being available it may have implications on Councils exemptions to liability under Section 733 of the Local Government Act should the subject land subsequent development be impacted by flooding.? Applicants for planning proposal are required to pay an application fee and the costs associated with any other required study. No funds have been allocated for private rezonings..
Now being assessed, which may require a report to Council if the variations sought are outside of delegated authority. Awaiting confirmation of information in relation to Aboriginal Cultural Heritage. Awaiting response from applicant re high likelihood of Aboriginal artefacts being found, as per advice from Nambucca Heads LALC.
? Concerns about roof colour and the glare that could be reflected from the roof up to houses that are elevated above the new proposed development. That, pursuant with Section 56 of the EPA Act, the Planning proposal be forwarded to the Minister for Planning for consideration through a Gateway Determination once the required fees have been paid and the additional information presented and acceptable to Council. The additional information and fees were subsequently submitted and the Planning Proposal was sent to the Department of Planning and Infrastructure (DoP&I) on 16 July 2011 requesting a Gateway Determination. On 16 August 2011 the DoP&I responded advising that a determination has been made that the proposal should not proceed and outlining the reasons for its determination (see attached). The applicant, Geoff Smyth Consulting was advised of the determination and has, on behalf of his clients sought assistance from Council to address the Departments concerns (see attached letter). 1??????????? That Council resolve to prepare a Local Growth Management Strategy - Residential Lands and seek advice from the Director General of the Department of Planning and Infrastructure as to what specific matters it requires to be addressed. 2??????????? That following receipt of the Director General?s requirements, a brief be prepared and estimates be sought from external consultants so that appropriate funds may be allocated for consideration in the 2012/2013 budget. 3??????????? That the applicant be advised that Council supports the proposal and that it proposes to prepare a Local Growth Management Strategy - Residential Lands during the 2012/2013 budget year which will include the consideration of Lots 11 and 12 DP 1017408 Lot 2 DP514920 Pacific Highway Lower Nambucca as an urban release area. Council could resolve to proceed as per recommendation 1 and formally seek quotations and allocate the necessary funds to have the matter completed as a matter of urgency. Should this be the case a supplementary budget allocation will be required at a budget review with the funds needing to come from General Fund impacting upon the bottom line. Or, Council could resolve that the Strategy be prepared in house by the Strategic Planner noting that this would not commence until such time as Council determines its Organisational Structure following the departure of the Manager Planning and Assessment and adequate resources are provided in the Planning section to enable the Strategic Planner to proceed. Council will recall that the rezoning of the subject land has been ongoing now for a number of years with the landowners investing considerable funds into the various studies undertaken over this land and towards the rezoning of the Lower Nambucca area. Initially through Nambucca LEP 1995 amendment no. 47, then during the preparation of the Mid North Coast Regional Strategy and under Draft NLEP 2010.? ????????? This land was required to be excluded from Draft LEP amendment no. 47 of the Nambucca LEP 1995 because the land is isolated from Nambucca Heads and available services. The land has not been identified in the mid north coast regional strategy for urban development and it is therefore inappropriate to zone this land R1. ????????? That Council not change the RU1 Primary Production Zone to R1 General Residential Zone in Draft NLEP 2009 over Lots 11 and 12? DP1017408 & Lot 2 DP514920, and the land owners be advised to pursue the proposal through the Gateway Planning Proposal process providing the justification and compliance with Appendix of the Mid North Coast Regional Strategy. Subsequently the new standard template Nambucca LEP 2010 was made and the landowner pursued a separate rezoning which was submitted to Council by Geoff Smyth Consulting on 17 November 2010. The matter was considered at Council?s 16 December 2010 meeting when it resolved to proceed with the proposal. 1??????? There is insufficient strategic planning merit to proceed with the proposal at this stage. 4??????? The planning proposal is not supported by an endorsed Council growth management strategy or the Mid North Coast Regional Strategy. 5??????? The planning proposal fails to demonstrate that there is an immediate to mid-term need for residential development in this location. The applicant was advised of the determination and has, on behalf of his clients formally responded suggesting that ?the rejection of the planning proposal to rezone the land does not appear to oppose the rezoning of the site itself but rather focuses on inadequacies in the current procedure required by the Council to justify the proposal?. In his response Geoff Smyth Consulting addresses a number of the inconsistencies raised by DoP&I in regard to the Section 117 Directions, SEPP (Rural Lands), an endorsed Growth Management Strategy or the immediate to mid-term need and requests Council?s assistance to address the Departments concerns. Council has continually supported this rezoning and the landowners have endeavoured to meet all the issues and provide the necessary justification for the rezoning to occur. To proceed further with this proposal, it is evident that Council needs to prepare a Growth Management Strategy ? Residential Land, to demonstrate that this location is supported as a future and immediate urban release area. The preparation of a Growth Management Strategy ? Residential Land is a requirement of DoP&I and will supplement the two Growth management Strategies that Council has already prepared, Rural residential land Release Strategy and the Employment Lands Strategy. Its scheduling however was not until the next year (2012) and was proposed to be undertaken internally by Council?s Strategic Planner. With the deletion of the Manager of Planning and Assessment from Council?s Environment and Planning Department, the preparation of the Strategy may now need to be deferred as the Strategic Planner will be required to undertake some of the Development Assessment workloads until such time as the organisational structure is determined and additional resources as engaged. Alternatively, the preparation of the Strategy could be prepared by an external consultant which of course, would then be dependent upon the allocation of funds in the 2012/13 budget. Also being considered at the meeting on 3 November 2011 is another planning proposal request which is not supported due to several matters one of which is the lack of a Local Growth Management Strategy ? Residential Land. Council could request the applicants clients to fund the preparation of the Strategy, however as the Strategy would cover the whole shire it is not considered equitable that this be pursued. Further the landowners for this Planning Proposal have already contributed approximately $20,000 to Council for the preparation of the Local Environmental Study for Draft LEP 47 which supported the proposed rezoning. A sparsely spaced nut tree grove exists on part of the land with the remainder being predominately cleared land. Any future development of the land should give appropriate consideration to stormwater and nutrient detention, setbacks and buffers to sensitive environmental receptors and the Nambucca River, noise and access issues associated with the Pacific Highway. The proposal will contribute to the land stock presently available within the shire and provide opportunities for diversified housing type and availability. The proposal will improve affordability of connecting services to the local area which is required to develop the lower Nambucca Business Park, and service the local accommodation facilities. The planning proposal is not identified as an agreed growth area under the mid north coast strategy and therefore any funds and resources put towards the rezoning process may not gain the proposed result. Should Council resolve to have a consultant prepare the Local Growth Management Strategy ? Residential Lands the funds would need to b budgeted for in the 2012/13 budget. An estimated $40,000 to $50,000 would be required.